It might be the ultimate National Baseball Hall of Fame autograph quest. 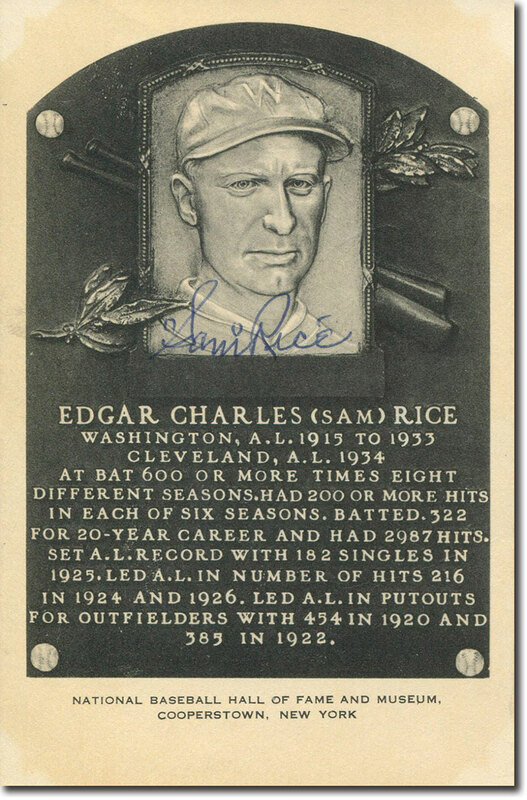 As if uncovering signatures of early inductees on any medium isn't difficult enough, how about trying to track down their autographs on black-and-white plaque postcards that were produced between 1944 and 1963? It's a daunting task, but veteran hobbyist Jim Doyle has been up for the challenge. 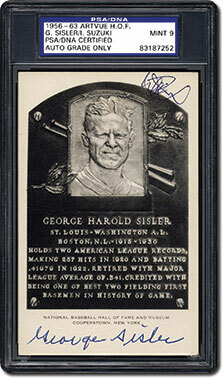 In fact, he only needs two signatures to complete his set on the PSA/DNA Set Registry. "What's so attractive about collecting the black-and-white postcards is that you have some of the pioneers of baseball in this set," said Doyle. "When you go down the list, you're talking about guys like Ty Cobb, Mickey Cochrane, Eddie Collins. ... 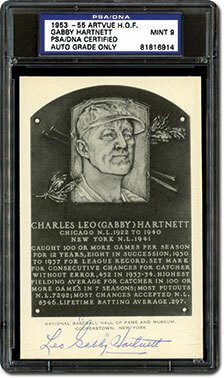 I like these cards because they kind of represent what you might call the first half of baseball history." 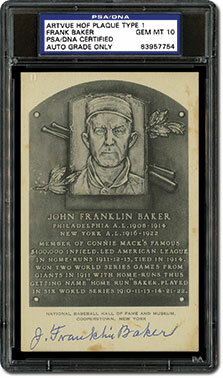 Forty-seven signed black-and-white Hall of Fame plaque postcards are required to complete the PSA/DNA Set Registry set. Postcards signed by Babe Ruth, Grover Cleveland Alexander, and Jesse Burkett are listed as optional signatures because so few authentic examples have been uncovered. Reports indicate that the Hall initially released a series of sepia colored postcards that were produced by Albertype in 1939, but by 1944, the same company was printing these postcards in black and white. 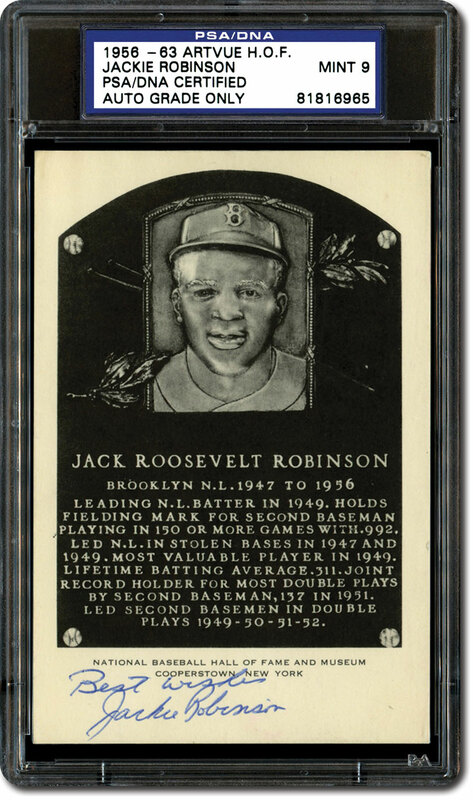 There are two kinds of Albertype black-and-white postcards: those manufactured in 1944 and 1945 have been deemed Type 1 and it says "Cooperstown, N.Y." in the last line of text below the plaque on the front. Type 2 Albertype postcards were distributed from 1946 to 1952 and these had New York spelled out on the bottom of the card front (Cooperstown, New York). In 1953, Artvue took over the production and continued to print them in black and white. The Artvue postcards can be distinguished from the Albertype postcards by the different fonts employed on the front and the different layout on the back. Like the Albertype postcards, there are two variations of Artvue postcards. Manufactured from 1953 through 1955, the first type showcases holes in the four corners of the plaques, while the second type, released from 1956 to 1963, has baseball shaped bolts in these holes. 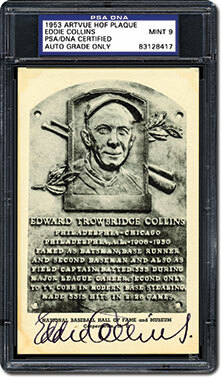 Only advanced collectors will pay a premium for an autographed black-and-white plaque postcard based on its type. Many of the black-and-white signed postcards are so rare that collectors will take an authentic autograph on any type. 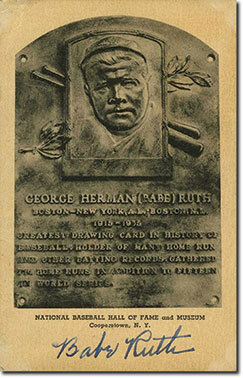 Ruth died in 1948, and with the black-and-white postcards unveiled in 1944, he only had a short window to sign these. "I think Ruth is probably the Holy Grail because he's Babe Ruth and his signature is as difficult to find on a black-and-white postcard as anybody else's," said PSA/DNA authenticator Kevin Keating. "Back when Ruth was living and still signing autographs, there was a short window for him to sign the black and whites, but the reason why you don't find them is that he didn't get any from the Hall of Fame to send out to people." Keating knows of one authentic black-and-white signed Ruth postcard. 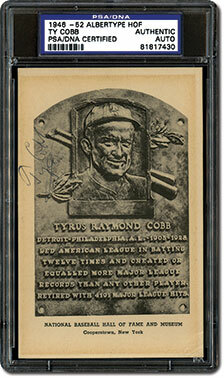 "I'm guessing that a signed black-and-white Ruth postcard might go for $200,000," added Doyle. Grover Cleveland Alexander's signature on a black-and-white plaque postcard has also proven to be elusive. The legendary hurler was elected in 1938 and died in 1950, but much of his life in between was plagued by alcoholism, poor health, and poverty. So it would have been difficult for even the most ambitious collector to track down Alexander to have him sign one of these cards. This helps explain why a signed black-and-white plaque Alexander postcard authenticated by PSA/DNA fetched a whopping $78,870 in a Huggins & Scott auction in February 2017. 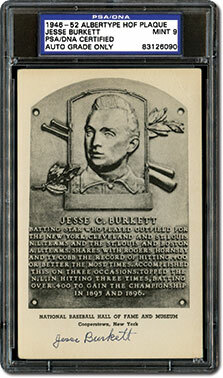 Late 19th and early 20th century superstar Jesse Burkett was honored in Cooperstown in 1946, but he died in 1953. While highly skilled, Burkett was also volatile and renowned for his cantankerous nature. "Burkett wouldn't answer his mail in the 1950s, so that was the problem with him," noted Keating. "He lived a little bit longer than some of the other guys who are really rare, but he didn't answer his mail, so it was really difficult to obtain his signature." A black-and-white Burkett postcard with a PSA/DNA MINT 9 signature sold for $40,800 in a Huggins & Scott auction in May 2017. Aside from Ruth, Alexander, and Burkett, one of the Holy Grail signatures on a black-and-white postcard belongs to Eddie Collins. 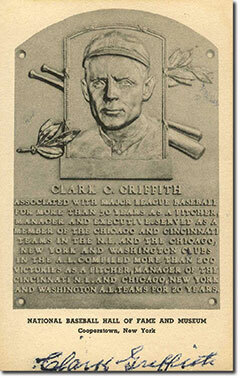 The six-time World Series champion second baseman was elected in 1939 but died in 1951. 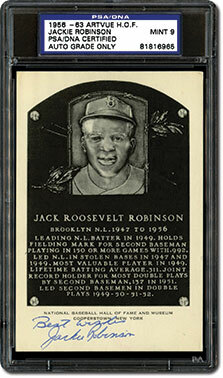 Since the black-and-white postcards were not manufactured until 1944, he only had a seven-year window to autograph them. One Collins postcard with a PSA/DNA 9 signature commanded $17,925 in a Huggins & Scott auction in February 2017. 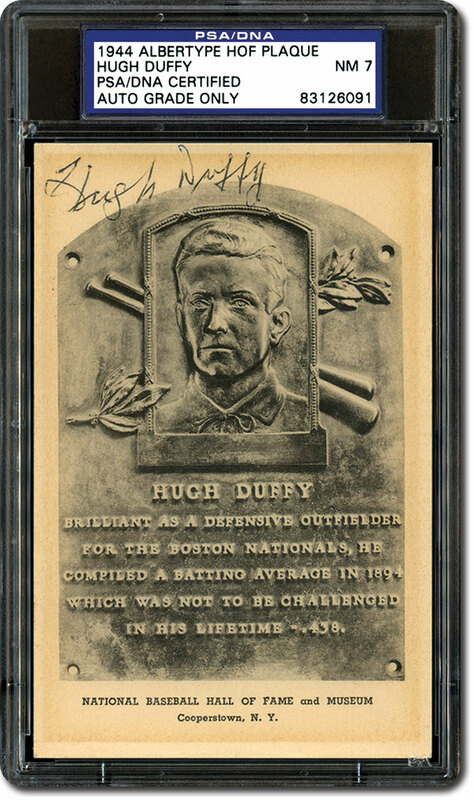 Hugh Duffy's signature on a black-and-white postcard is also extremely elusive. This is one of the two that Doyle needs to complete his set. Duffy was enshrined in the ball hall in 1945 and he died in 1954. An authentic example with a PSA/DNA NM 7 signature (signed twice) fetched $9,082 in a Huggins & Scott auction in February 2017. That's also the only example Doyle has seen. Surprisingly, it's also tough to find a black-and-white postcard autographed by St. Louis Cardinals pitching great Dizzy Dean. The colorful right-hander, who was generally an accommodating in-person signer, was elected to the Hall of Fame in 1953 and didn't pass away until 21 years later. So there was ample time for autograph seekers to have one of these postcards signed. "My guess is that Dean had a stack of black-and-white postcards and his wife probably signed all of them," Keating said. "And every now and then, when they had a request for a signed photograph, they would probably throw one in the mail. ... There are real ones out there, but they are enormously rare." 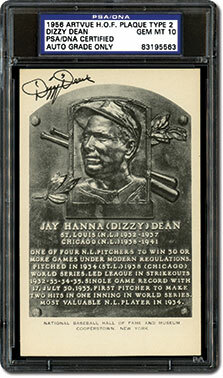 A Dean black-and-white postcard with a PSA/DNA GEM-MT 10 signature sold for $21,211.25 in a Huggins & Scott auction in February 2017. 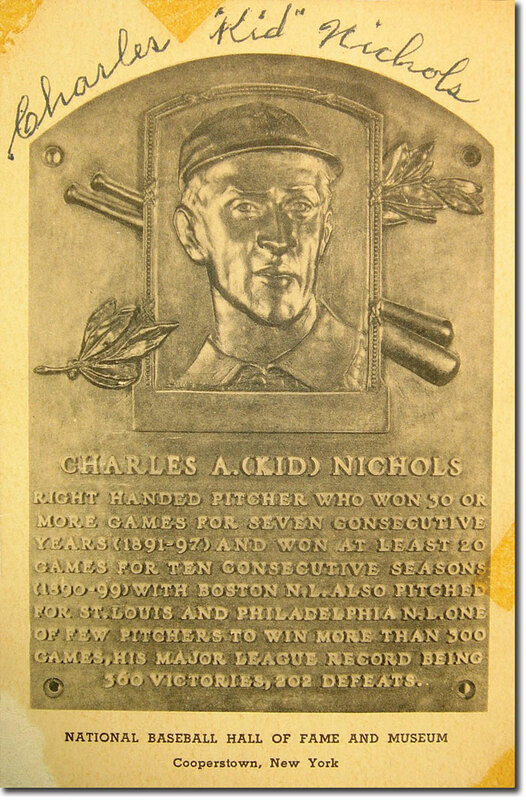 Four other evasive, signed black-and-white plaque postcards are Kid Nichols (elected 1949, died 1953), Clark Griffith (elected 1946, died 1955), Al Simmons (elected 1953, died 1956), and Tom Connolly (elected 1953, died 1961). 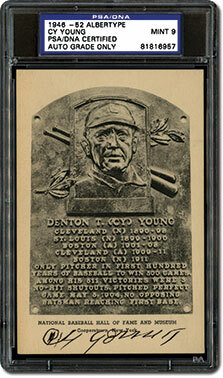 Keating says that back in the 1950s, many people didn't even know these plaque postcards existed. 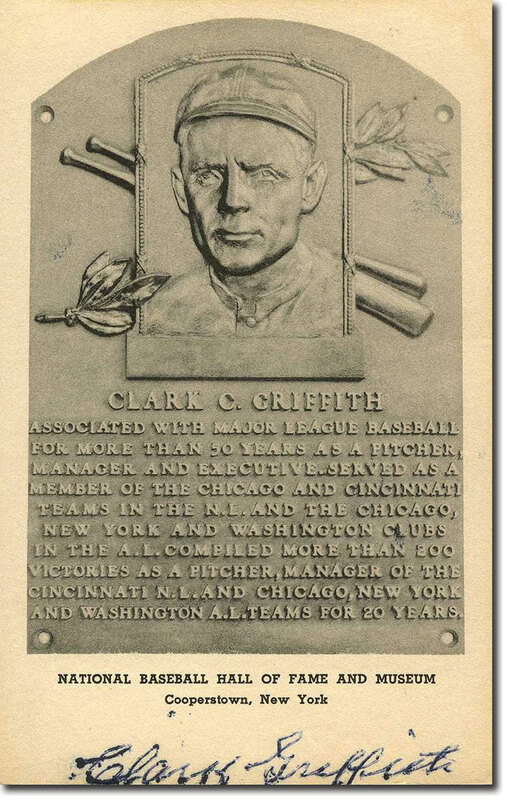 "The Hall of Fame produced them, but they didn't advertise them, and back then, there wasn't an Internet, gift catalogs, or anything like that," noted Keating. "So to get a black-and-white plaque postcard there were really only two ways to do it: one was if you were at the Hall of Fame since they sold them at the gift shop, and the other way was if a player happened to have some and they would send them to you in a response to a letter. 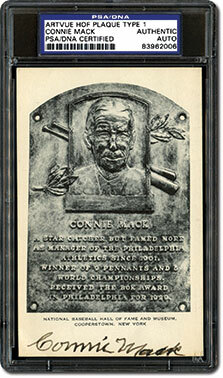 And some players did that because the Hall of Fame would provide them to players upon request." Doyle does have a signed Nichols postcard in his set. 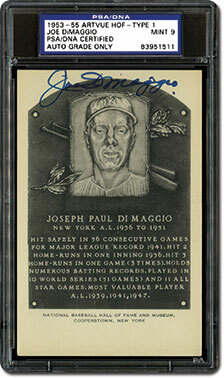 He purchased it raw and the autograph on it was later graded PSA/DNA 10. Doyle just recently acquired a Connolly-signed black-and-white postcard. 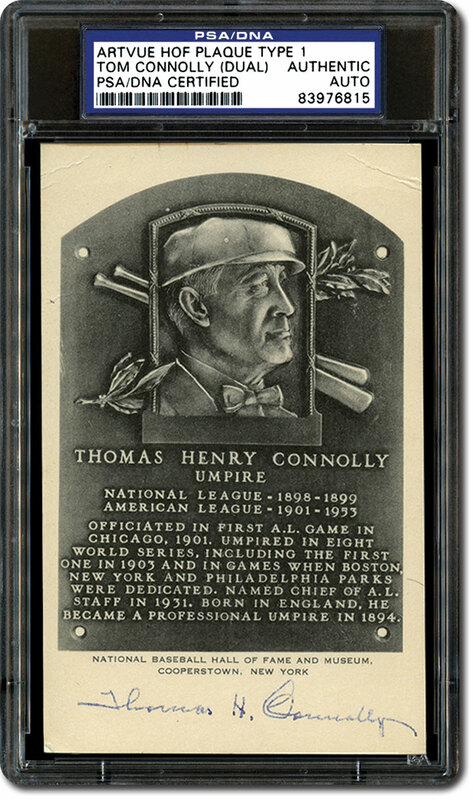 One Connolly (double-signed) black-and-white plaque postcard with a signature authenticated by PSA/DNA garnered $8,400 in a Huggins & Scott auction in August 2017. 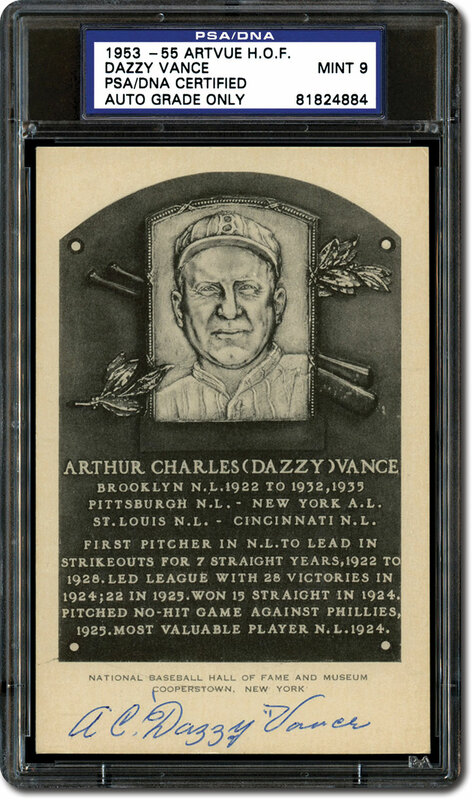 As you can see, it's challenging to find a signed example of many of these postcards in any form, but for collectors like Doyle who also covet high-quality signatures, completing this set is even more demanding. Doyle has 15 PSA/DNA 10 signatures in his No. 1 Registry set and 23 PSA/DNA 9s. "The goal I started out with was if I could get them all in [PSA/DNA] 9s and 10s, I'd be really happy with my set," said Doyle. 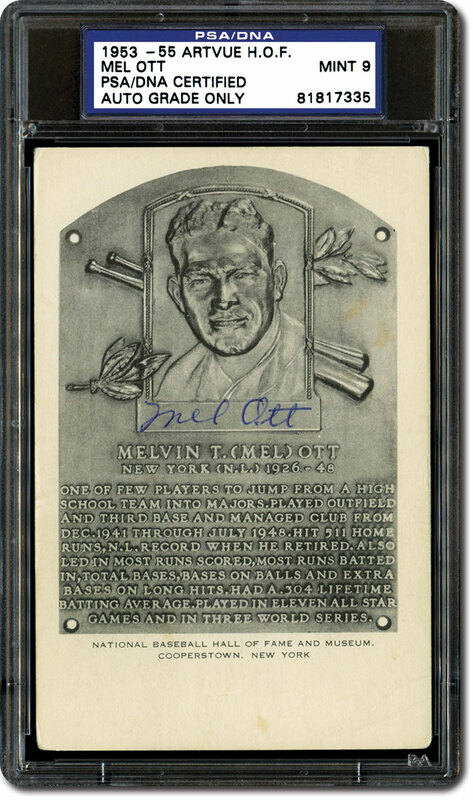 But some of the signing quirks of the Hall of Famers have made it difficult to find high-grade examples of their autographs. 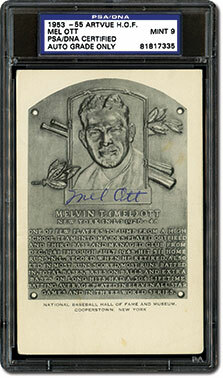 Keating says Mel Ott, Tris Speaker, and Sam Rice were guilty of signing inside the plaque portion versus signing on the white border surrounding the plaque, where it is most visible. "I think it probably had to do with the fact that they considered these postcards to be photos to some extent," explained Keating. "And a lot of guys just intuitively sign across themselves when signing a photo." Doyle and most collectors prefer the signatures to be in the white space and either at the top or bottom of the postcard. 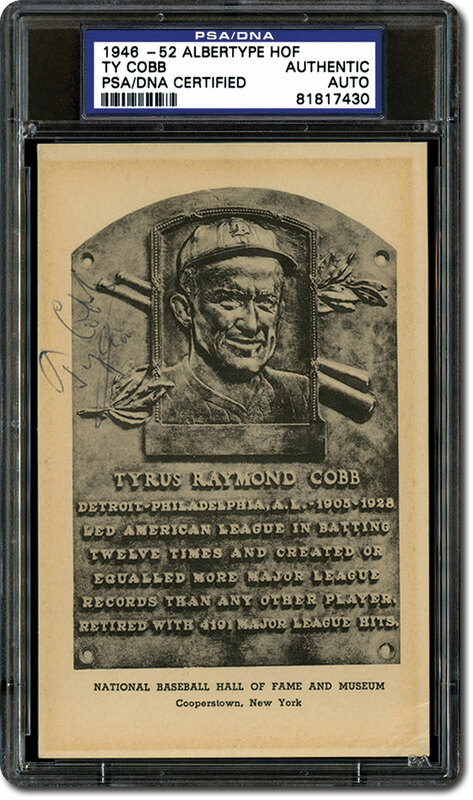 However, he specifies that whenever the signature is at the top or bottom and situated very close to the plaque outline, he doesn't like it when "the signature bleeds into the plaque [portion]." 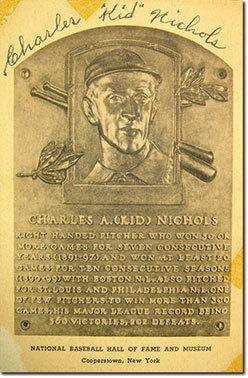 It can also be difficult to find the black-and-white plaque postcards themselves in top condition. "I did find of a number of these with tape markings and what appeared to be glue markings," said Doyle. "Many of these cards were apparently adhered to albums, and collectors either taped the ends with scotch tape or put a little dab of the old kind of white paste on them [to help them stay in place]." According to various reports, in the mid-1980s, the Hall of Fame sold their surplus stock of black-and-white plaque postcards to a local dealer who then eventually sold a large quantity of them to a man from Long Island. 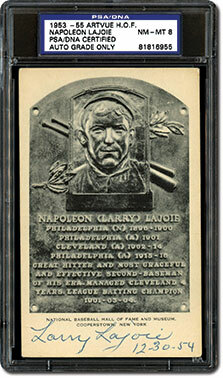 Shortly thereafter, a large number of autographed examples of these cards began suspiciously appearing on the market. 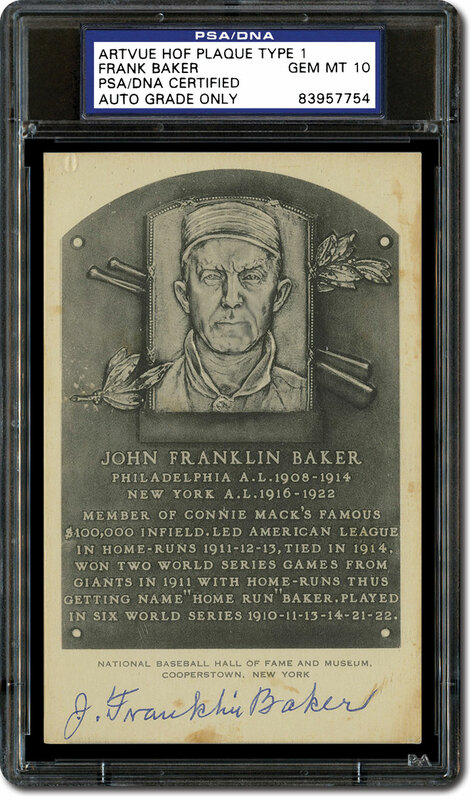 Keating says there's a known collection of a large quantity of counterfeits that included forgeries of, among others, Speaker, Connolly, Simmons, Dazzy Vance, and Gabby Hartnett that began surfacing on the market in the late 1980s. "There were a variety of different names [that were forged]," explained Keating. "And they came in groups of 20 to 30, so there were big quantities of these guys and we still see them circulating in the hobby. ... There are still some out there buried in people's collections and they get re-circulated from time to time." The prices for the rare PSA/DNA authenticated black-and-white plaque postcards have increased significantly in recent years. 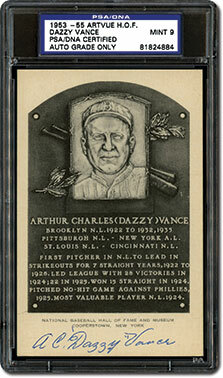 Doyle says the competition for these signed black-and-white plaque postcards can be wide ranging. "The question becomes is it a competition to put together a black-and-white set or is it a competition to put together a Hall of Fame set period?" asked Doyle. "Or is it a competition to put together a group of old-time players? I'll bet you the person that bought that Grover Cleveland Alexander [for $78,870] was not putting together a black-and-white plaque postcard set." 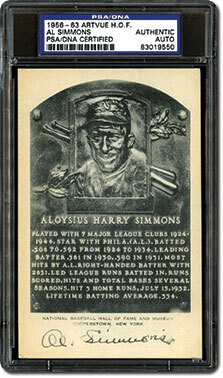 For more information on baseball autographs, please visit https://www.psacard.com/autographfacts/#4baseball. Please feel free to contact Kevin Glew at [email protected] if you have any additional information or comments. Thank you to Jim Doyle and Huggins & Scott Auctions for providing images for this article. Please note that the Set Registry rankings reported are those as of November 2017.